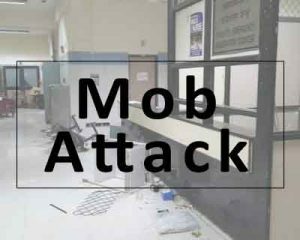 Kolkata: A nearly 100 strong mob vandalised a private hospital and beat up a number of staff following the death of a patient. “The CMRI Hospital at Ekbalpore in the south-western part of the city was vandalised this morning and some staff beaten up by a mob,” a senior Kolkata Police official said. The mob resorted to the violence alleging negligence on the part of the hospital in the treatment of a girl patient admitted. The girl died at the hospital this morning following which a mob from the nearby Babubazar area entered the CMRI premises and broke glass panes, computers and other materials at the reception and billing office, the official said. The mob also resorted to a road blockade on Diamond Harbour Road at Ekbalpore crossing during morning rush hours leading to harassment of office-goers and other people. A large contingent of police led by senior officers persuaded the agitators to lift the blockade and brought the situation under control. Police forces were also deployed in the hospital premises to ensure there was no further vandalism. Relatives of patients admitted at the hospital and at the out-patients department fled the premises owing to the vandalism. All serious pts should go to govt hospitals and relaions should not be allowed in hosp. No doctor/hospital is going to take serious and emergency pts in future .ultimately these hooligans have to suffer. Already doctors are reluctant to take serious pts.